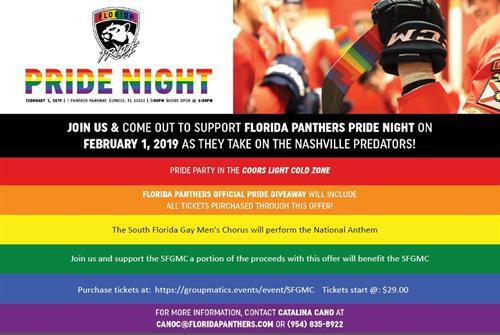 The Gay Men's Chorus of South Florida and the Florida Panthers have teamed up again to provide the community with discounted opportunities to enjoy the Florida Panthers PRIDE NIGHT game against the Nashville Predators ON February 1,2019! A PORTION OF PROCEEDS GO TO GMCSF! Parking included in ALL tickets! **All inclusive areas available with food buffet, beer wine and soda! **Lord Stanley’s Loft sections (328-330) food and drinks included!